Updated Thursday January 25, 2018 by Jeff Wozniak. My child is playing T-Ball, What should I expect? 1) What age does my son/daughter have to be in order to play Tball? Your child must be 4 years old by August 31st of the calendar year. 2) Will the teams have a practice time? Yes. Weather permitting, practice is held 1-2 days a week during the 4 weeks leading up to the first game. Practices begin usually in mid-March. Each team will be assigned a day of the week, field, and practice time with an optional Saturday practice. All practice schedules will be passed on to the players by the coach. 3) Do all the players hit off of the tee during games? No. During each at-bat, the player will get the chance to swing at a series of pitches. After the 4th time (or whatever the coach decides) the player swings and misses the ball, the player will use the tee to hit the baseball. 4) What gear/equipment should I get for my child? It is recommended that you get your child baseball spikes, baseball/athletic pants, a baseball glove, and a water bottle. Batting helmets will be provided through the league but each player is welcome to bring their own. The league will provide each player with a team jersey and baseball cap. 5) How many games should we expect each week? 6) What does an inning look like and how many innings are in a game? Each game consists of 3 innings. An inning is one team batting through their line up and then the other team batting through their line up. An inning is not determined by “outs”. 7) When/how is a game cancelled? The two coaches will make the decision regarding whether or not to play/reschedule a game. It will depend on weather, field conditions, and overall player safety. The coaches and commissioner will work hard to reschedule the cancelled game and it may result in a double header. Instead of the normal 3 inning game, a double header is 4 innings, split into 2 2-inning games with a snack/drink break in between. 8) Where are the TBall fields located? Most games will be played on the TBall field located behind Concordia in Cabot. Some games, mostly on Saturdays, will be played on the farm team fields at Sebco. Parking lot for the Sebco fields are located right behind the pool. 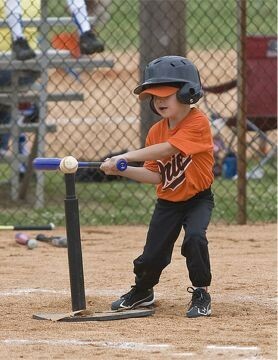 9) Does T-ball conflict with spring soccer? Yes it does. Soccer season starts before Tball and overlaps with Tball season for 2 weeks. 10) How can I help with the cost of signing up for TBall? At sign-ups you will receive a pack of tickets. Any money you receive for selling tickets is yours to keep to off set the cost of TBall.